2. They need rapid fork truck access to each individual pallet. 3. The need plenty of aisle space for fork trucks to move up and down the aisles to retrieve pallets at will. 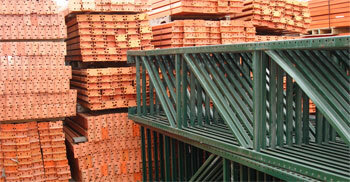 In larger warehouses, most conventional pallet storage is single-depth. In smaller facilities where space is limited, pallet racks can be built double depth to allow one pallet to be stored behind the other, thus doubling storage space without the need to add additional decks or aisles. 1. They need to convert 70-85% of their available floor space and vertical cube into organized pallet storage. 2. They experience low turnover of homogenous products and thus leave pallets on the rack for extended periods of time. 3. They cannot afford to waste any floor space at all on multiple aisles. 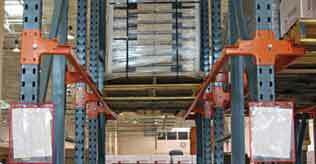 The drive in design allows for pallets to be stored on the inside of the racking system. An entrance allows forklifts to drive into the rack itself to retrieve them. This makes the most of floor space in cramped quarters, and is especially useful in warehouses with taller ceilings where a great deal of vertical space can also be converted into inventory storage space. 1. A need to minimize retrieval time so pallets can be unloaded from the rack more quickly and taken to trucks. 2. A simple, non-motorized means of moving the pallets to forktrucks without forktrucks having to go to them. 3. A low-maintenance system that offers a predictable pace with minimal likelihood of system failure. Live storage racks actually move pallets to waiting forklifts by using gravity as a force of motion. A slight incline in the rack allows a pallet to slide toward the end of the system to be picked up. When it is retrieved, another one slides in right behind it. The push back system works in much the same way as the live pallet storage system, although it uses trolleys and rolling rails in addition to the force of gravity. When a pallet is removed from one end, the others slide down slightly to fill the gap. Loading and unloading is easily done from the central aisle. 2. The entire rack rests on a motorized base that can be moved either with manual controls or remote PC.